One-piece tempered stainless steel with a heat-treated anodized black finish. Like professional throwing knives, this fantasy-style throwing axe features cut-out designs in the handle to ensure a well balanced weight. The sharp edge and piercing points on this throwing axe ensure maximum target penetration every time. 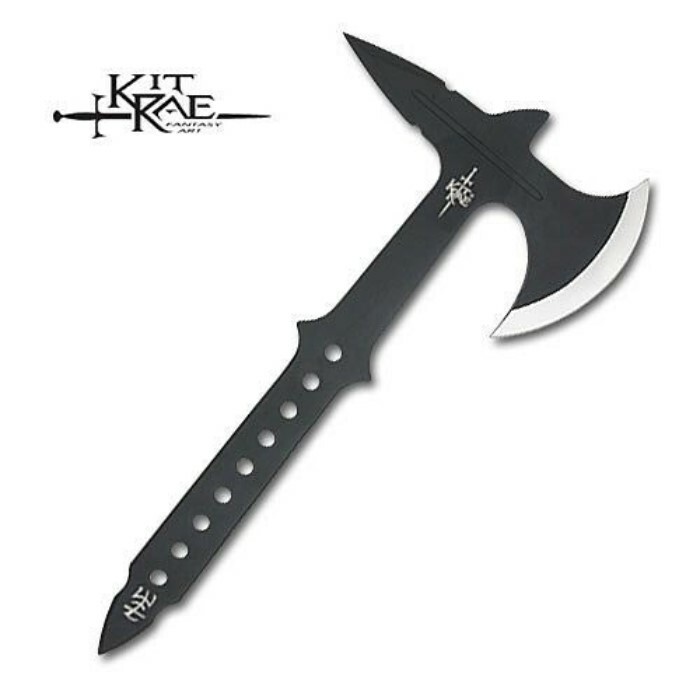 Best of all, it has the signature mark of world-renowned fantasy knife designer Kit Rae. Includes nylon blade sheath. As a pretty avid thrower of bladed weapons, I though this hawk was maybe a little less then par for my taste. It really light. It throws well, but I had to lash the handle with para cord to get a better grip. The metal is thin, thus causing a "twanging" noise when it sticks. It was pretty sharp right out of the box, no complaints there. Overall its not bad for the price or beginners. Not my go-to hawk though. This is a great throwing axe. It has perfect balance and sticks every time. I am a little worried about the holes in the handle because they are unnecessary as this would be light enough for throwing without them. Despite being somewhat light which is not necessarily a bad thing because it allows ease of use for women and men who are on the weaker side it fits my hand perfectly. Really this is the perfect axe for anyone who wants to get into throwing even my girlfriend, who had never thrown any kind of weapon in her life, is able to stick this every time. It came extremely sharp ( i cut myself opening it) and the sheath is pretty awesome as well. All in all if you are looking for a fun axe for throwing purposes look no further.